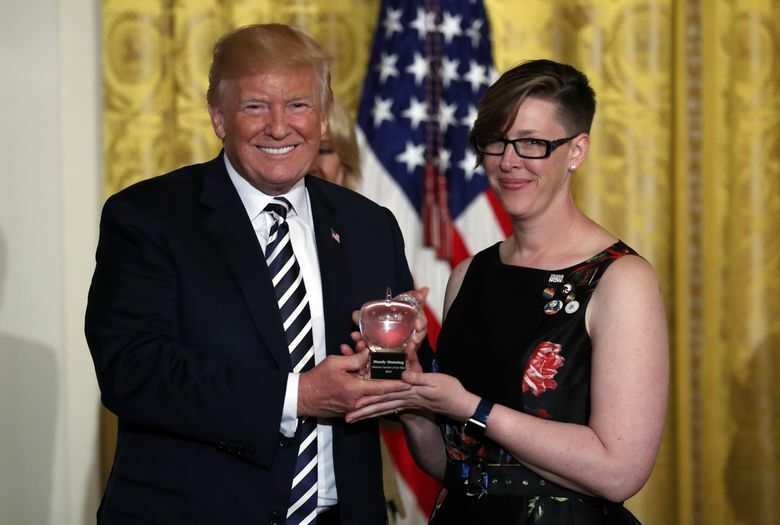 In the East Room of the White House, President Donald Trump presented Mandy Manning with the National Teacher of the Year award — a crystal apple — and said she has done an “outstanding job” as an educator. National Teacher of the Year Mandy Manning brought a manila envelope to her meeting with President Donald Trump at the White House Wednesday afternoon. The folder was labeled “Dear Mr. President!” on the outside. Inside were letters addressed to Trump from students at Spokane’s Ferris High School, where Manning teaches, and letters from community members. Manning, 42, works in the high school’s Newcomer Center, where she teaches English and math to immigrant and refugee students. Manning is often a student’s first teacher in the United States. 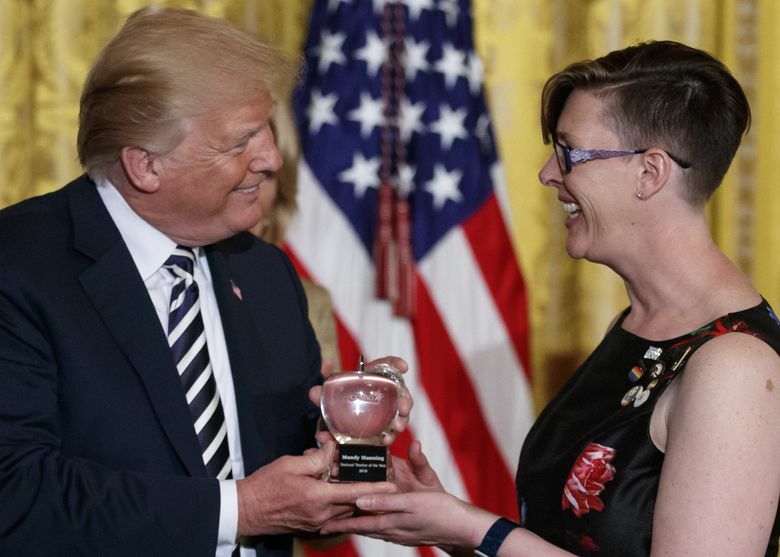 In the East Room of the White House, Trump presented Manning with the National Teacher of the Year award — a crystal apple — and said she has done an “outstanding job” as an educator. “Your tireless dedication doesn’t just inspire your students, it inspires all of us, and I can tell you, it very much inspires me,” he said. In his brief speech, Trump noted that Manning teaches math and English to students at Ferris High, though he didn’t mention that she specifically works with immigrant and refugee students. During his campaign for president, Trump proposed banning Muslims from entering the country. As president, he temporarily suspended the U.S. refugee program and has taken a hard line against both legal and illegal immigration. On Wednesday, Manning also met with Cabinet members, including U.S. Department of Education Secretary Betsy DeVos and Secretary of Labor R. Alexander Acosta. At a panel discussion with other National Teacher of the Year finalists, Manning reiterated the contributions her students have made, and want to make, to their new home. “I know how much my students bring to our nation … and our country is better because my students are in it,” she said. As National Teacher of the Year, Manning will serve as an advocate and spokeswoman for the teaching profession. Over the course of a year, she’ll travel to more than 150 speaking events across the nation and internationally.